The Single Estate English Potato Vodka by Chase Distillery is a distillate that is treated with manic attentions. It is sweet and creamy and has exciting aromas. The Potato Vodka is very good iced, or at room temperature with ice in the glass, so that it can be appreciated to the utmost of its evolution of flavor and scents. THE VODKA The Single Estate English Potato Vodka by Chase Distillery is a distillate that is treated with manic attentions. It is sweet and creamy and has exciting aromas. The Potato Vodka is very good iced, or at room temperature with ice in the glass, so that it can be appreciated to the utmost of its evolution of flavor and scents. THE DISTILLERY William Chase has created a successful business with the cultivation and trade of premium quality potatoes. In 2004, after discovering the potato distillate Vodka, very different from that of cereals, William Chase's decision to found a distillery was almost instantaneous. That is how Chase Distillery was born, housed in an old converted barn, located in the heart of Herefordshire countryside. The distillation process used by Chase is very crafty and rather laborious, but it allows total control of the quality of the products, all of which are bottled and labeled by hand. 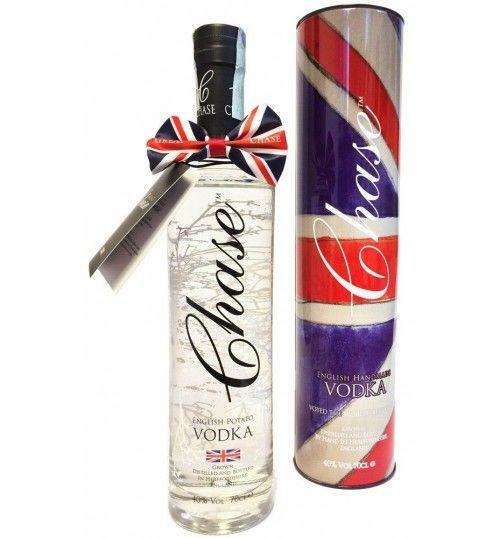 The first Chase potato vodka bottle was launched in April 2008 after two years of work. It has been, and still remains, the first and only British potato vodka in the world. Cultivating, while distilling the potatoes, Chase Distillery creates high quality products with a true "pedigree". Before 70,27 € tax incl. Tasting The nose delivers delicate notes of white pepper and licorice. In the mouth it shows an intense, sweet and creamy flavor, characterized by aromas recalling slightly smoked almonds and black pepper. William Chase has created a successful business with the cultivation and trade of premium quality potatoes. In 2004, after discovering the potato distillate Vodka, very different from that of cereals, William Chase's decision to found a distillery was almost instantaneous. That is how Chase Distillery was born, housed in an old converted barn, located in the heart of Herefordshire countryside. The distillation process used by Chase is very crafty and rather laborious, but it allows total control of the quality of the products, all of which are bottled and labeled by hand. The first Chase potato vodka bottle was launched in April 2008 after two years of work. It has been, and still remains, the first and only British potato vodka in the world. Cultivating, while distilling the potatoes, Chase Distillery creates high quality products with a true "pedigree".